For all the affluent people in India, who want to migrate to the United States, given below is the fast track process to obtain a US Green Card. Majority of Indians who strongly believe in US education standards, are going this route for their children’s higher education. Under this program, prospective migrants must invest USD $500,000 to $1 million, based on the US immigration rules in any of the employment generating program. Qualified individuals, who can invest in the US EB-5 investor program directly, will get permanent residence in just 15 months. This permit grants permanent residence to the principal applicant and his family members. 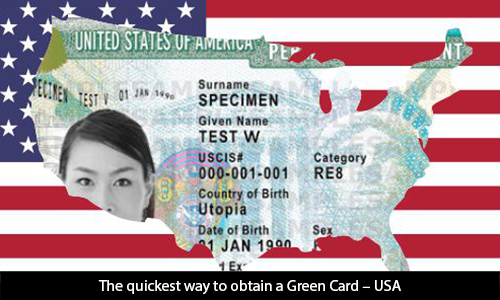 You don’t require undergoing tough screening of other employment and student based Green cards, which typically take years to make you eligible and apply for the same. Currently, there are 200 projects in the United States (that include ten people of Indian origin), which have opened doors to foreign nationals with high net worth, to invest in their ventures. These investment opportunities enable investors to secure US green cards through United States Citizenship and Immigration Services’ (USCIS) popular visa program the EB-5. I Investors must create ten full-time jobs with a minimum investment of USD $500,000. Spouses and unmarried children under the age of 21 can get U.S. Green Cards through this scheme.